UK jazz label founded by aspiring drummer Carlo Krahmer and Peter Newbrook in 1947. 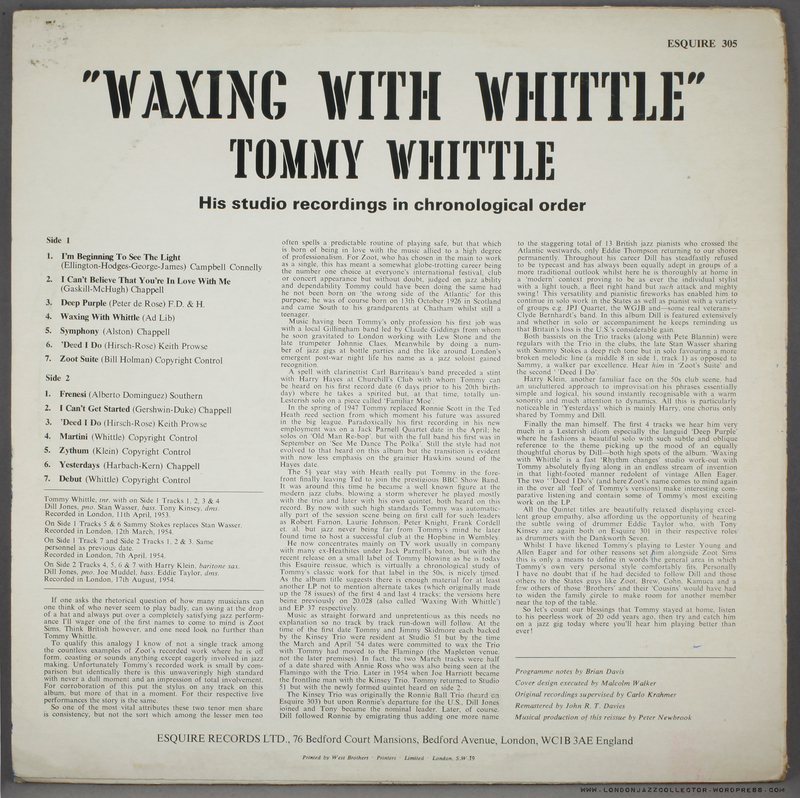 It issued recordings by British musicians, and others under licence, notably from the American Prestige label and its sub-labels New Jazz from the mid-Fifties to early Sixties. These UK issues bear all the detail of the US original master metalwork, including Prestige catalogue numbers and Rudy Van Gelder hallmarking. This is in contrast to London American Jazz recordings and Contemporary Vogue which were mastered the UK by Decca from copy tapes, with their own matrix codes. Esquire lasted until the mid-1970s. After Carlo’s death Esquire was run by his widow Greta. In the 1980s Newbrook reissued some of the Esquire jazz catalogue in an “Esquire Treasure Chest” series of LPs. 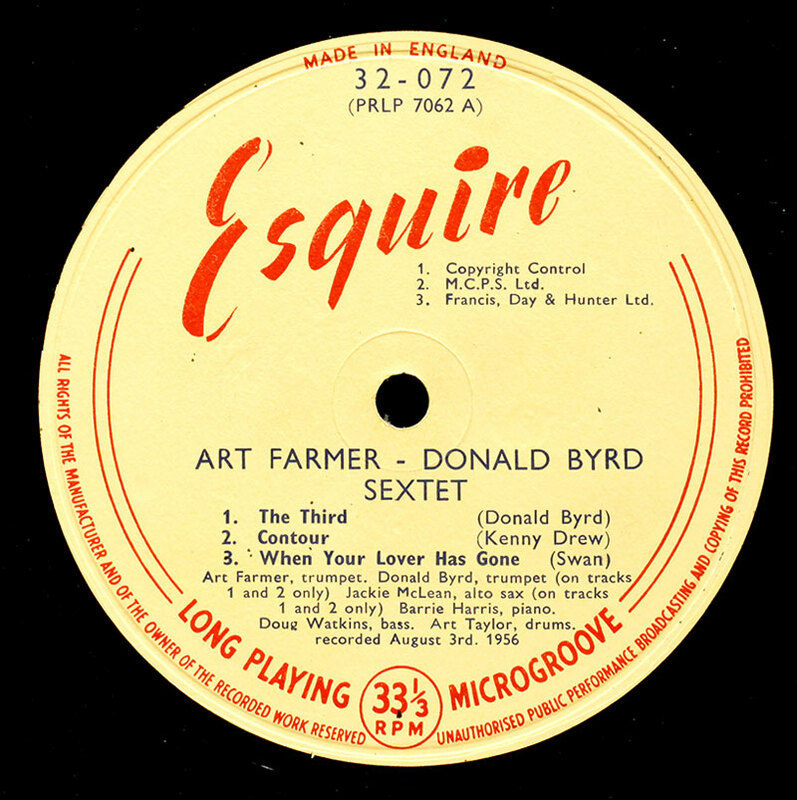 Esquire’s license to distribute Prestige records in the UK ended in the mid Sixties, taken up by Transatlantic, a label founded by music entrepreneur Nat Joseph. Transatlantic pressings are generally very good, mastered in the UK from copy tapes instead of US stampers as previously. The Esquires are sonically the match of US originals, pressed on 180-220gm vinyl and they never made the mistake of using recycled noisy vinyl as Prestige did in the early Sixties. Their only let down was the sometimes poor graphic design of alternative covers, though once you get your eye attuned, there is a kind of house-style that you feel quite fond of. “Harry Peck” deserves the blame or credit, depending on your point of view. The audio quality is not great, though its hard to know where to pin the blame, as this sample was recorded by label founder Kramer and remastered for this reissue, and impossible to know who pressed it, but it shows no hallmarks of anyone like the majors. The graphic design is worse: an object lesson on how not to sell records. They look very cheap and nasty, though the music can be very good. Peter Newbrook accumulated many fine jazz records, including his own Esquire releases, and his collection was sold by the family to at least one dealer I came across. Dual interest in film and music recording. Building crystal sets. Musical education. Working at Warner Bros. studios, meeting Monty Berman and developing an interest in jazz; playing vibraphone. Becoming record collector. Meeting Carlo Krahmer in 1938, Krahmer’s career. Making location recording in Birmingham in 1938, Krahmer’s career. Making location recording in Birmingham in 1947 with Krahmer’s Chicagoans and Humphrey Lyttleton and getting record pressed. Stranglehold of major record companies. Getting discs pressed by the British Homophone Co. Selling through mail order. Obtaining rights to Charlie Parker and Errol Garner discs through Blue Star. Getting discs pressed Moving to Decca. Running label as ‘family’ concern from Krahmer’s home. Post-war jazz clubs in London. Signing up new talent. Owing rights to foreign labels. Starting classical series of avant-grade music; pop series and children’s series. Keeping ahead o competition. Working with Blue Star to get round union ban. Cutting discs with Ray Nance and the ‘Ellingtonians’. Recording American musicians during World War II. Esquire’s recognition of the importance of be-bop and modern jazz. Making direct-cut microgroove LP in 1952. Later development of company. The Treasure Chest series and remastering recordings for ‘Living Presence Sound’. Outside recordings. His holdings of released material and Krahmer’s collection. The Esquire organisation. The Starlite label, releasing popular music, rock’n’roll and calypso. Are the Stateside pressings comparable to the esquire? Or better find me a US mono blue label then? 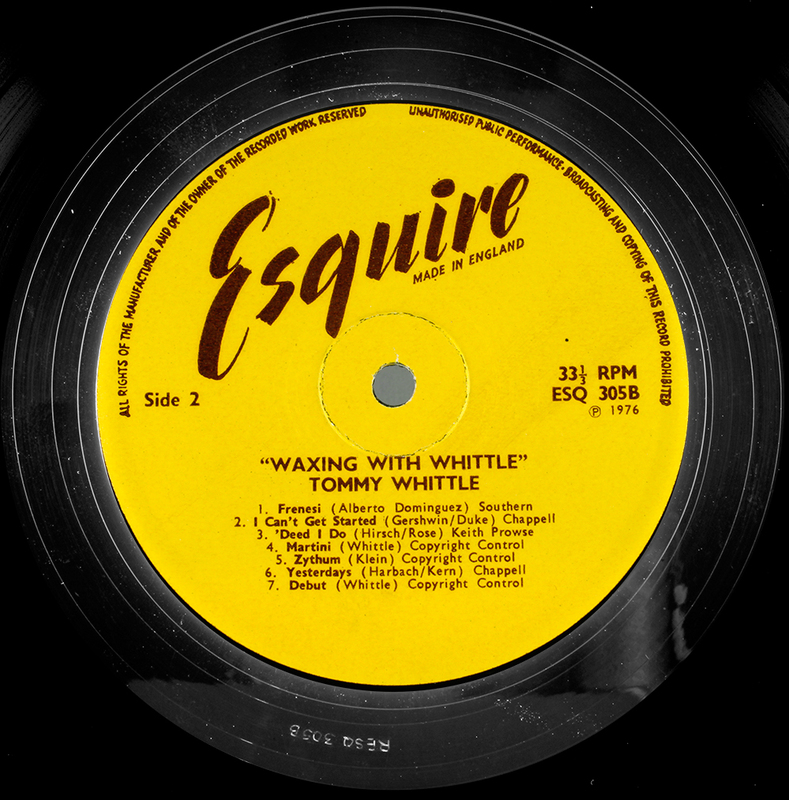 What’s special about the Esquires is that they were cut by Rudy Van Gelder in the States, so you get fifties British pressings using US metalwork and in my limited experience of first press US Prestiges the pressings leave much to be desired, so the Esquires are the best “first pressings” you can get. Aren’t there more releases on Transatlanic/Xtra than Statesides? I’ve never really thought about which label put the most Prestiges out in the sixties, but not all the later UK issues overlap with the Esquires or each other, so certain titles might on have had one UK issue while others had two. Are the Stateside pressings comparable to the esquire? Thanks, I knew it was coming as I exchanged emails with the writer working on the piece for Record Collector a few months ago. Good to know it has reached print. Looks like I might have buy a copy. Now that I take a second look I see you are mentioned in the thanks list. Spreading the gospel in print as well, nice! I probably have no more than one or two Esquire LPs, but I do have some 10-inch and 12-inch 78s–all Bop. I also now have two Esquire record catalogs, one from 1953; the other from July 1956. Each cost $6.99 American. The two provide a good perspective of both 78 and early LP issues for the period that interests me most. 32-013 Donald Byrd. “Byrd’s Eye View”. This session is ex Transition (TR-J-LP 4) and the liner notes give credit to Arnie Ginsburg, “Boston’s Great Jazz Recording Engineer”. And, indeed, the audio is something else. Nowhere one can hear Doug’s bass and Hank’s subtle tenor so well recorded as on this album, better than any Blue Note in the corresponding period. Just gorgeous. But now the strange thing, on side A of this Esquire album I notice a hand-etched RVG mark in the dead wax. It should not be there! Both sides have TRLP 4 hand-etched. A check on the French Transition issue (Jazz Sélection Vogue 30.059) learned me that the dead wax has just the aforementioned TRLP 4 hand-etched, but no RVG. Has anyone the US Transition issue? No US Transition LP in my possession, but is this a question of the difference between the recording engineer and the engineer (RVG) who (re)mastered it? I’m going from memory but there are a number of early Blue Notes and probably Prestige which were recorded by others but remastered by Rudy for those labels, hence his initials appear as the mastering engineer. my original Byrd’s eye view, TRLP J-4 has RVG hand etched on side one only. TRLP-J-4A on side 1 and TRLP-J-4B on side 2.
dottore/LJC: so Esquire reproduced the Transition for 100%, but Vogue did not reproduce the RvG mark. LJC may be right in observing that the recording was actually done by Ginsburg, but the mastering by van Gelder. I recently picked up Esquire EP 136, which doesn’t seem to appear on the available discographies. It’s the Johnny Windhurst Quartet from 1955. playing “You do something To Me” and “Back in your own Backyard”. Both tracks appear on the lp “Jazz On Columbus Avenue”. Fantastic site, wish I’d got here sooner. I could be wrong but I think it may well be the ‘Happy Wanderers’ who make an appearance in Lindsay Anderson’s beautiful 1950’s documentary ‘Everyday except Christmas’. Nice juicy addition to a long dead thread; I have the ten inch Rollins Quartet, which is Esquire 20-050, with Monk. Lovely sound as others have said, but the thing to note is RVG etched not stamped in the dead wax, plus the full PRLP catalogue number, which is also bracketed on the labels, so from metals, not copy tapes?. Maybe somone can help. I have an Esquire 10 inch of ‘Errol Garner and His Rhythm’ performing ‘Impressions’ and ‘Reverie’. Recorded 20.8.49 – Labled: 10-256 (P-13145-ID). Can anyone tell me much about this? Nice article. I just got the Esquire counterpart to the Prestige 10″ of Tadd Dameron with Clifford Brown. 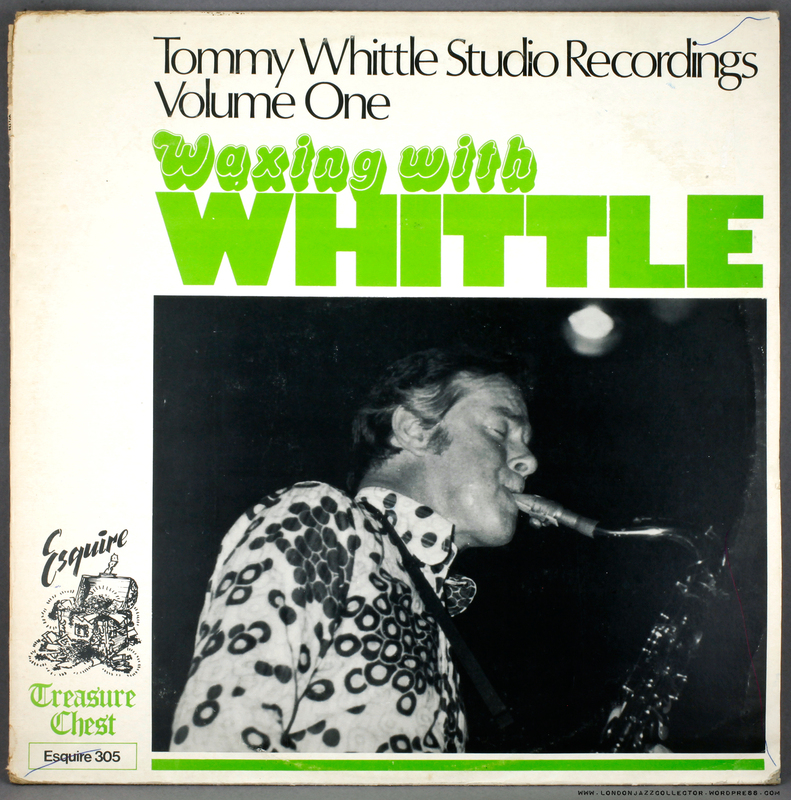 The sound knocked me out; great definition and warmth, far better than than my copies of the prestige US 10″ and 12″. I have a Monk trio 10″ Esquire which also beats the US issue, and other Rollins and Miles albums which sound great as well. It seems Rudy Van Gelder was sending prime copies to the UK..
esquire cat .no 32-081 is not listed i have 32-081 my father is the sax player on it ;Charles poncia aka Chappy LeRoy .this was a one take recording. Hi, and thx for the identity of the mysterious 32-081 I was unable to fill that gap searching online – quite a few of these titles I have never seen come to auction. Great article. I own about 100 Esquire jazz albums and can fill in a couple of the missing titles and cover photos. Audio quality compared to Prestige and New Jazz varies but can be better. As best I can tell there are 3 cover variations and three pressing plant variations. Hi Will, and welcome. You are ahead of me – I have around forty Esquires now. I scraped a lot of the pix from Popsike so they are ebay-type crap quality. There are a few holes here and there, and I am thinking of replacing this with a “proper” archive. Your collection could help, thanks.